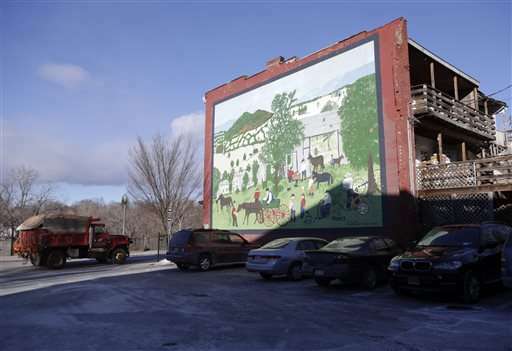 Two years later, the U.S. Environmental Protection Agency has warned residents of Hoosick Falls not to drink or cook with water from municipal wells, and a plastics plant has agreed to install a $2 million carbon filtration system at the village water treatment plant. Hickey's campaign began with suspicion about industrial pollution in the factory village near the Vermont border. His father had worked for 35 years at a plant that made high-performance plastics similar to Teflon, so Hickey searched online for "cancer" and "Teflon." Perfluorooctanoic acid, a water and oil repellent, had been used since the 1940s in products including non-stick cookware, stain-resistant carpeting and microwave popcorn bags. Manufacturers agreed to phase it out by the end of 2015 shortly after DuPont reached a $16.5 million settlement with the EPA over the company's failure to report possible health risks associated with PFOA. A scientific panel that conducted health studies as part of a DuPont settlement of a West Virginia class-action lawsuit concluded there was a "probable link" between PFOA exposure and kidney cancer, testicular cancer, thyroid disease, high cholesterol, ulcerative colitis and pregnancy-induced hypertension. In Hoosick Falls, nobody has ever scientifically documented that the village has an unusually high cancer rate, but Hickey and a local doctor had heard enough anecdotal evidence that they felt it should be addressed. "There's always been talk around town about how there's a lot of cancer," Hickey said. "When my dad, who didn't drink or smoke, was diagnosed with kidney cancer, that made it more personal." Dr. Marcus Martinez, the family doctor for many of the village's 3,500 residents, added there certainly seemed to be a high rate of cancer there, particularly rare, aggressive forms. The 44-year-old Martinez himself is in remission from aggressive prostate cancer. When the two men suggested testing the village water supply, part-time Mayor David Borge at first refused, citing state guidelines. New York state classifies PFOA as an "unspecified organic contaminant" and doesn't require testing for it. The EPA has a non-enforceable guidance level of 400 parts per trillion—roughly 4 teaspoons in enough water to fill a 10-mile string of rail tankers. Hickey used his own money in summer 2014 to have water from his kitchen tap and other sources tested. The results showed PFOA at 540 ppt from Hickey's home, exceeding the EPA's guidance. 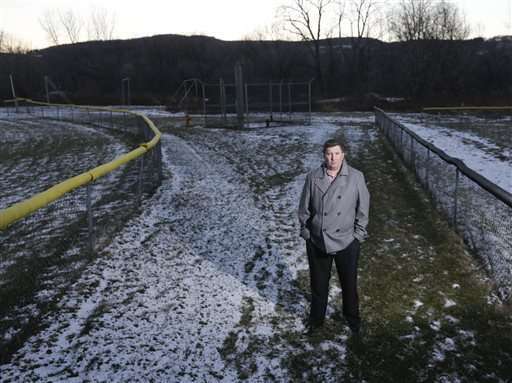 Village officials subsequently tested the municipal supply and found PFOA at similar levels. Saint-Gobain Performance Plastics, part of a Paris-based global conglomerate, in 1999 became the fifth owner of a plastics factory in Hoosick Falls. 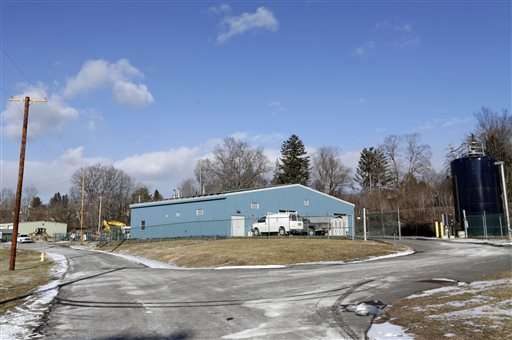 It conducted tests in the summer of 2015 and reported a PFOA level of 18,000 ppt in groundwater under its plant, 500 yards from the village's main water wells. "Saint-Gobain Performance Plastics is committed to helping the village of Hoosick Falls with this situation," company spokesman Carmen Ferrigno said. 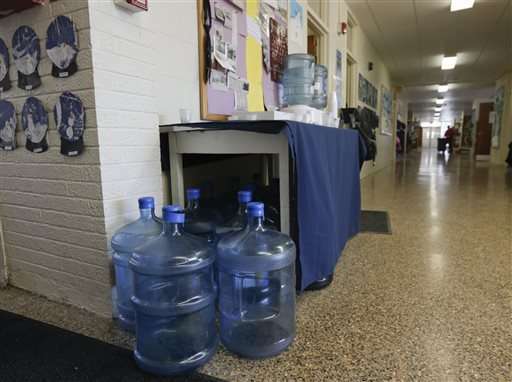 While the source of the PFOA contamination hasn't been identified, Saint-Gobain has been paying for bottled water for residents since November and has agreed to pay for filtration to remove the chemical from the public water supply, he said. Hickey and Martinez, along with Albany environmental lawyer David Engel, weren't satisfied. They wanted people to be told not to drink the tap water, as well as a full investigation and remediation. Engel contacted Judith Enck, who heads the EPA region that includes New York. She issued a statement in December warning residents not to drink or cook with village water. Until then, state and village officials had told residents the water was unlikely to cause health problems. On Jan. 14, Enck and a panel of leading EPA scientists addressed a standing-room-only crowd at Hoosick Falls' high school auditorium. 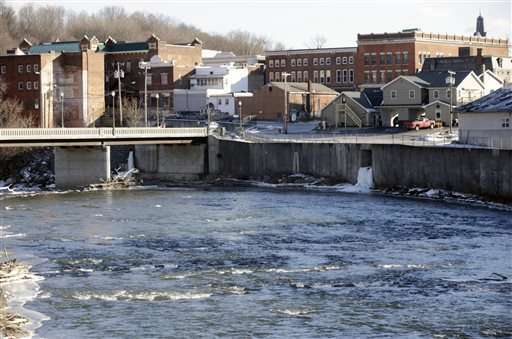 The same day, New York officials asked the EPA to add the Saint-Gobain plant and other possible sources of contamination in Hoosick Falls to the Superfund priorities list. The state health department also recently announced plans to study cancer rates in the village and vicinity. 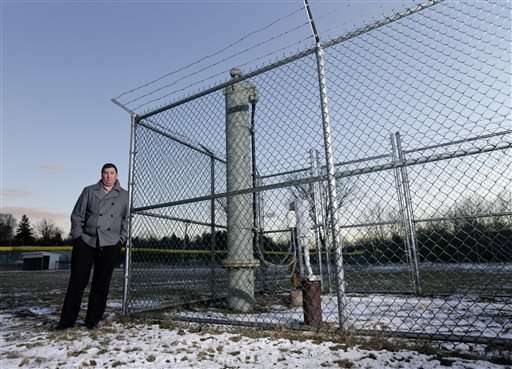 "We are giving this contamination problem a high priority," Enck said. "A very detailed study of groundwater is needed in Hoosick Falls to know what we are dealing with and how to best address it." Engel said that the village's plan to install filters at the water plant is a good first step, but that the long-term solution should be to establish new wells to replace the contaminated ones. Kevin Allard, 58, who worked at the plastics plant in the 1980s, said his mother died of pancreatic cancer at 54 and his father died of thyroid cancer at 81. In 2006, a 25-year-old friend of Allard's son died of pancreatic cancer. Now, he worries about the health of his children, in their early 30s. "They grew up on that water," he said. "That's what concerns me." If four teaspoons in a ten mile row of tankers is enough to cause this unusual amount of cancers, then it must be extremely toxic in incredibly small amounts, and anyone working at the source should be bursting with cancers from a mere whiff of the stuff they're working with every day. 540 parts per trillion is really a homeopathic dose of anything. There must be something more going on here. Maybe there have been large releases of the chemical, and the concentrations they're seeing now are a residue of leaks happening 10,20,30 years ago?